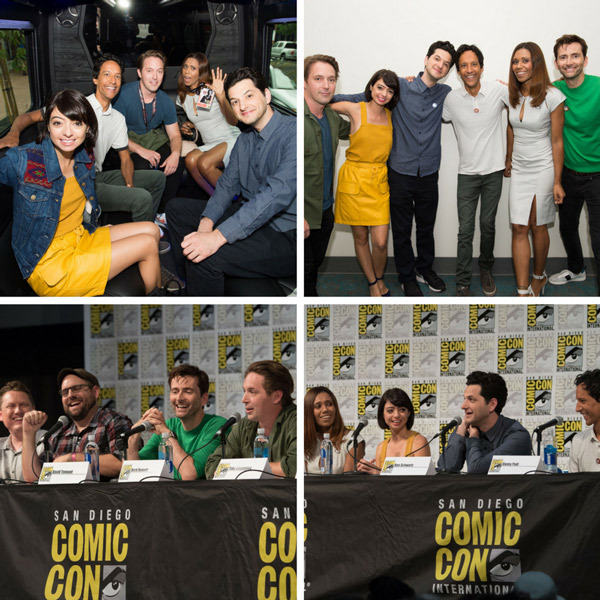 The cast and creative team of Disney XD's highly anticipated animated comedy-adventure series "DuckTales" created a duck-blur of excitement at San Diego Comic-Con on July 21. Stars David Tennant (Scrooge McDuck), Danny Pudi (Huey Duck), Ben Schwartz (Dewey Duck), Kate Micucci (Webby Vanderquack), Beck Bennett (Launchpad McQuack) and Toks Olagundoye (Mrs. Beakley) were joined by executive producer Matt Youngberg and co-producer/story editor Francisco Angones for the annual fan convention, where they participated in a panel moderated by Entertainment Weekly's Marc Snetiker. "DuckTales" will premiere in a one-hour television movie to be presented for 24 consecutive hours August 12 (beginning at midnight, EDT/PDT) on Disney XD. Then, the series will debut with two new episodes Sept/ 23 (7:00 a.m., 11:00 a.m., 2:00 p.m., 5:00 p.m., 8:00 p.m., 10:30 p.m., EDT/PDT).